Tanks to our loyal readers! 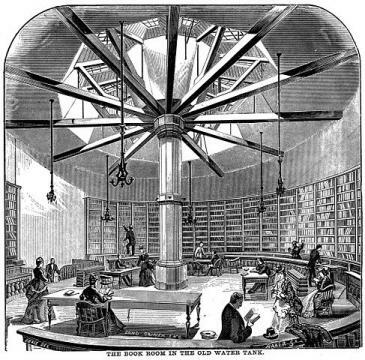 (The illustration shows a temporary library facility established in an abandoned water supply reservoir in the wake of the Great Chicago Fire of 1871.) And best wishes for the new year from all of us at NCSE. A Yankee at Oxford: John William Draper at the British Association for the Advancement of Science at Oxford, 30 June 1860, Notes and Records, December 23, 2015 (published online in advance of publication) — A look at the legendary encounter between Thomas Henry Huxley and Samuel Wilberforce, with the aid of recently rediscovered letters from and to John William Draper, who was on the spot. Pseudogenes, Intelligent Design, and Kitzmiller (part 1 and part 2), BioLogos, December 28–29, 2015 — Dennis Venema debunks a Discovery Institute staffer's attempt to argue that the beta globin pseudogene isn’t good evidence for the common ancestry of humans and chimpanzees. New Video of Giant Squid Surfaces, Deep Sea News, December 29, 2015 — Great news for cephalopodophiles everywhere from Craig McClain! An extremely rare sighting in Japan’s Toyama Bay of the giant squid Architeuthis not only confirmed but even with video. The Scariest Part of this Weird Weather is Coming Soon, Slate, December 29, 2015 — It’s warmer at the North Pole this week than it is in Southern California. Eric Holthaus explains that this is just a scary preview of what’s to come later this century.